The MoEF's assessment of the environment, which should be the foundation for strategic planning in the ministry, is highly inadequate, and is a poor second to similar efforts by environmentalists themselves, writes Shripad Dharmadhikary. "Presently, more than 45 per cent of the average annual rainfall, including snowfall in the country, is wasted as natural run-off to the sea." Reading this statement, one would guess it is made by a promoter of large dams proposing to build more of those, or wanting to link rivers to use this 'wasted' water. Indeed, this statement reflects the basic philosophy that has governed water resource development in the country for decades, namely, that every drop of water from rivers and water bodies has to be extracted for human use. In recent years, there has been increasing acknowledgement that this philosophy is deeply flawed, and that significant water needs to be maintained in rivers as environmental flows. Therefore, it is somewhat shocking to find that the above-quoted statement is from the Ministry of Environment and Forests (MoEF), the very institution that is meant to protect rivers. This also explains why the MoEF has been completely unsuccessful in protecting the environment in this country, and has instead been reduced to a rubber stamp for clearing "developmental" projects. What is of equal concern is that this statement is being made by the MoEF in the latest edition of its State of Environment Report. (prepared by Development Alternatives in active collaboration of the MoEF and published by the MoEF. Available at this link). 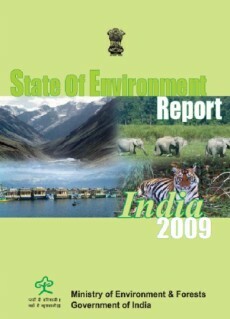 According to the preface written by Secretary, MoEF to this recently released report, "The State of Environment Report India 2009 presents an overview of the environmental scenario of our country. Its objective is to serve as a baseline document to help assist decision making and policy formulation." This makes it a document of considerable importance. But many flaws combine to render this report highly inadequate for meeting these stated objectives. This article mainly discusses the water related sections, but in general the conclusions apply to the rest of the report too. Over-exploitation of rivers: The section presenting the status and trend of the aquatic environment misses out on many key points, or presents them inadequately. A major issue of environmental concern is the drying up of large number of rivers in the country due to over-extraction of water, building of cascades of dams and massive diversions of water. Some of the large basins have become closed basins - that is, the river water no longer meets the sea. This issue has not even been mentioned in the report. The MoEF has been completely unsuccessful in protecting the environment in this country, and has instead been reduced to a rubber stamp for clearing 'developmental' projects. Groundwater loss: Groundwater is the source of drinking water for a significant majority of India's population, and meets substantial requirements of irrigation. Over-exploitation of ground water in many parts of the country has emerged as one of the most serious problems. India's major food producing areas like Punjab and Haryana are most severely affected. Yet, the issue of groundwater over-use is not highlighted in the report, though there are references to it scattered in the report. But in the main Status and Trends section, the report says that "the figure for net draft of groundwater considering the present utilization indicates that a substantial portion of the total potential (about 68 per cent) still remains untapped". (Page 41) This gives a misleading picture of the groundwater situation in the country. Bad data: Another flaw in the report is the use of data that is old and from secondary sources. This is the case even for parameters that the MoEF itself is supposed to monitor. For example, in the section on Water Pollution, the report mentions that central and state pollution control boards have identified 1532 grossly polluting industries in India. But the source for this information is a World Bank publication, and that too of 1999. In fact, the MoEF should be the primary source of information on such parameters, since pollution is something the ministry itself is supposed to monitor! And its State of Environment reports should be presenting latest figures. But having fallen down on the job of tracking pollution properly, it is forced to rely on whatever little it can source externally. In the chapter on water security, it is stated that the total water requirement for the country for various activities will reach 1450 cubic kms per year by 2050. This, it is pointed out, is significantly more than the current estimate of utilisable water potential, at 1122 cubic kms per year. (Page 104). Yet, after a page, a table sourced from Central Water Commission puts the water requirement in 2050 between 973 and 1180 cubic kms per year. The difference is huge - it is the difference between whether we will have water or not! It is true that sometimes estimates and predictions are difficult, and subject to many assumptions; hence we can have differing figures. This is especially true of areas like climate change. But the point to emphasise is that the report cannot present two differing figures without commenting on them and the difference. But this is exactly what it does. The last serious issue that needs to be pointed out is the "compartmentalisation" of the chapters. While the structure of the report is good, cross linkages between sections - the essence of environmental analysis - are inadequate. Also, the report should have made stronger connections between the environment and specific components of current plans for 8-9 per cent economic growth. For example, the chapter on Biodiversity mentions that India has two of the world's biodiversity hotspots. It also mentions that "deforestation due to hydropower and mining projects are perhaps the greatest threats to biodiversity of India." But considering that one of the two global hotspots in India is the eastern Himalayan region, it would have been important to specifically refer to the massive dam building program in the North-east, and in Arunachal in particular, where MoUs have been signed by just that one state for more than 100 hydropower project totaling 30,000 MW. Unless this is done, it will not reflect in the policy recommendations. Ironically, the hydropower program of North-east finds mention in the Climate Change section, as a part of the response to combat it, but without referring to its devastating impact on biodiversity. And all of this is compounded by another problem with the report. This relates to the basic report-writing issues like proof-checking and referencing. In places, its figures seem disproportionate. For example, the quantity of waste-water generation from industries is given as 55,000 million cubic meters per day, or 55 billion cu m per day. This means that in the whole year the discharge would be 5 times more than the entire water received by India. So clearly, this is a typo. But all the references to and discussions about India's Water policy refer to the 1987 Water Policy. Is this also a typo? The country adopted a new water policy in 2002; hasn't MoEF heard of this? Other inadequacies include improper or inadequate referencing, wrong usage of units, etc. All in all, this report, which should be the foundation for strategic planning in the Environment ministry, is highly inadequate. A comparison of this report with the first and second State of India's Environment reports brought out by the Centre for Science and Environment (CSE) is inevitable. The CSE reports broke new ground and set the standards with the high quality of their assessments, with the depth of their analysis and the extensiveness of participation. It is important for the MoEF to work towards, if not actually reach, the benchmarks set by CSE reports. For this, it will be necessary for MoEF to rework its report extensively. The new Minister, Jairam Ramesh, has shown some quick and important initiatives in responding to civil society concerns. He must look at the lacunae in this document and initiate a process to address them and bring out a report that can truly be the basis for balancing "economic growth with environmentally sustainable practices" and for tempering "growth with environmental equity, sustainability and social justice" - the objectives articulated by him in his Foreword to the report.